Another large, former Little Chef, now selling fast food only. 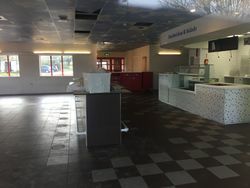 Inside the former Little Chef, stripped out. The A303 has several signposted 'local facilities', including some signed from the opposite side of the roundabout. It is located on the A358, but not the major road that leads to Taunton - that is a fourth (of five) exit from this roundabout. The roundabout is called 'Southfields' (nicknamed 'Horton Cross'), but 'Ilminster' is the name promoted by the facilities. It is one of few A-road services to have motorway-style 'Tiredness Can Kill' signs on each approach to it, suggesting there is a history of fatigue-related problems here. It opened in 1989 as a Happy Eater. The restaurant is positioned in the corner right next to the roundabout, while the forecourt is higher up, closer to the entrance. This restaurant became a Little ChefHistory and Burger King in 1996. In 2002 it was promoted to Little Chef Choices, which saw it gain a Harry Ramsden's and Caffe Ritazza. These were removed and Coffee Tempo! joined instead. In 2012, the restaurant was one of several to receive a thorough refurbishment, gaining a Good to Go in the process. As one of the more profitable sites it lasted until January 2018, when the new owners' rights to the name expired. The signs were taken down and the restaurant continues as EG Diner. 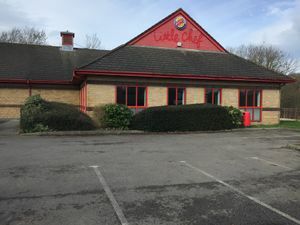 The EG Diner closed on 31 October 2018 and it was thought at the time that the Burger King would close to with a KFC Drive Thru replacing both units in January 2019. However, in actual fact the Burger King stayed open and is currently the only trading unit in the old building. It is unknown when the work will start on KFC.